Jahurul in his place. Mominul for Ash. ken? bathroom e Harpic nai? So many injuries, why do we even bother to play? This might be blessing in disguise. Why the heck he wasted so many deliveries? I am disgusted with this match. I understand your disappointment, in fact we all are in the same boat. The question is: why we are more prone to injuries than any other sides? I think carelessness, lack of knowledge, awareness is responsible for these. Look at Shafiul/Mashrafee/Nazmul's injuries. Most of them get hurt during practice or for not taking care of themselves- just look at Shahriar Nafees. Why the heck in this world you would go and use the blade to repair your bat? And that happened when a tour was on the corner! SN was extremely careless that's for sure. It's important that wee take care of our own bodies, injuries so that it doesn't deteriorates. But I don't see it's happening now. And as a result we have to rely on pacers like Shahadat Hossain- whose bowling average and strike rates are way higher than Sir Don Bradman!! We need to come out of these hell. But I see no hope. I am now really concerned about his availability in our Zim tour. We need him in Tests against Zimbabwe. Hope he recovers well enough before the Zim tour. Ei hairline fracture ta ki jinish ? Ball laglo haate, betha pailo angul e r poira gelo mathar chul ? ki ar bolbo! pura kufa laga ekta series. Dano tey bhalo calcium achey - bhalo korey calcium khetey hobey har mojbut korar jonno. Bad news. We need him for Zimbabwe Tests. I hope he can recover in time. Any chance we had of winning an ODI have well and truly gone. Is that a foregone conclusion? - against WI Tamim averaged 18 and we won that series. No need Dano Need pure goru'r Dudh!!!! 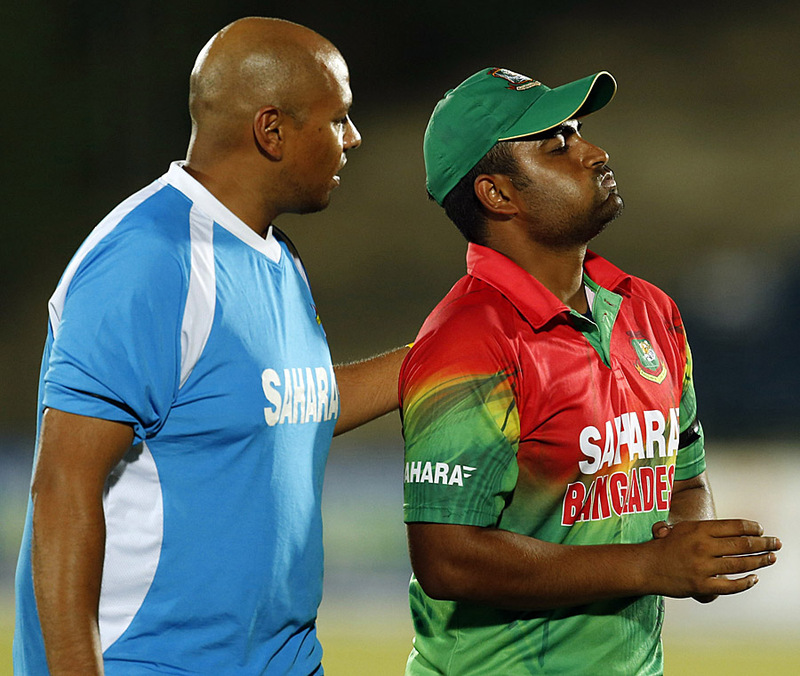 Tamim Iqbal is nursing a broken thumb and Bangladesh may well be one batsman short. We'll find out soon. 2- Lords 2010 Hurt his elbow fielding near the boundary but continued to play as it was not as severe as everyone thought.